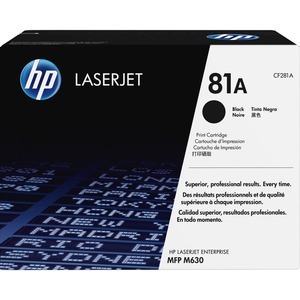 HP 81A toner cartridge produces outstanding printing results in your HP LaserJet Enterprise Flow MFP M630dn, M630z, M630f, M630h; M604N, M604DN, M605N, M605DN, M606N, M606DN and M606X. Rely on this Original HP black toner for crisp text, sharp graphics and impressive business documents. Built-in cartridge intelligence delivers excellent print quality and consistent results. Cartridge yields approximately 10,000 pages.